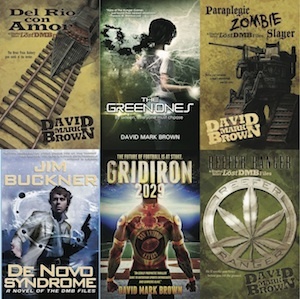 David Mark Brown — Page 4 — Writer. Novelist. Redneck. Granola. Welcome to the DMB Universe. 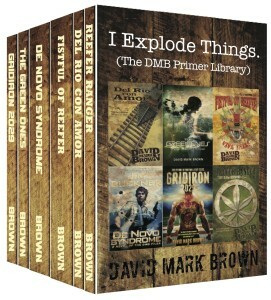 Receive the DMB Universe primer library free! If you're new to my stuff, this is the perfect place to begin. These seven stories range from pulpy westerns to sci-fi thrillers. And while they can be read independently, one thing you need to know about me--I love expansive worlds. Most of my books are interconnected within the same Schism 8 universe. Making the connections isn't necessary to enjoy the stories, but it's the sauce that makes them extra tangy. Despite some folk predicting the demise of email, the email list is growing in importance (especially for indie authors). I’ve blogged before about Amazon’s changes over the last year and a half that have been gradually throttling indies. The price gap between tradition and indie has closed. Free as a temporary promotional tool (pulse) has lost its potency. And now Kindle Unlimited is choking indies further. All of this should have succeeded in convincing the indie author of the importance of owning direct access to readers. It should be evident that Amazon blitzes and Bookbub bursts are no longer the panacea many made them out to be (the horror). I’ll be the first to admit my idiocy. I’ve blogged steadily for eight years, and I’ve only collected emails via my blog for the last three. I resisted forever, mainly out of laziness and lack of direction. The focus of my blog has meandered from Industrial Hemp, to humor, to wine, science fiction, the Simpsons and now mostly subjects of writing, publishing and geek culture. Until just recently, my email list languished around 500 subscribers. Over the last several months, I’ve retooled my indie author business to grow sales via my own website. I still sell stuff on Amazon and Kobo, and I hope I always will. But I no longer drive traffic there. If the connection to my stories is made by me, I want the buy to happen directly. If Amazon and Kobo bring me new readers, then they can have a cut. If they do nothing to get the business, then why should I pay them 30% royalty? Due to this new focus on my personal website, I’ve put renewed efforts into the old email list. In the last few weeks, I’ve grown it to 1,500. I hope to forge it into a *solid 2,500 by the end of the year. (*40% open rate and 10% action rate.) Here is how I’ve done it so far. There are lots of ways to grab emails, some less ethical than others. For clarity, I’m talking about growing a list of people that actually care about what I’m doing and creating. An email list that provides somewhere in the neighborhood of a 30% to 40% open rate and a 5% to 10% response rate (clicking through links, downloading stuff, etc.) is tough to cultivate and maintain. But that’s what I’m talking about–quality emails from real fans. The good news is that new platforms are rolling out all the time. Out of my two current favorites, one has been around for a couple years and two others are brand new. In today’s episode, I continue to narrate the first episode of The Green Ones. Boom shizzle. Calli has attempted to kill Centavo. Unfortunately, this plan was ill conceived, and his telekinetic abilities easily thwarted her. Now, she and Neca have undergone a crazy plan to help save Olin. One mad step at a time, Calli will do whatever she has to in order to give her brother a fighting chance. At the moment, that means fetching a special plant from her mother’s garden and taking it to a connection of Centavo’s…inside Immortal City… dumdumdum. Thanks for listening, and enjoy the show. On this episode of Schism 8, I narrate scenes 4, 5, and 6 of the first episode of The Green Ones. Does it get any better? Calli finally meets the infamous gangster and kingpin, Centavo. Is he all he is made out to be? In fact he is much more. Calli discovers connections between the old man and herself that she could have never dreamed. Will those connections help her efforts to save her brother or hinder them? Tune in to find out as the exciting story continues! And above all, enjoy the show!